Super Optimizer is the PUP that uses misleading techniques to prevent removal. Use Reimage to locate malicious components and get rid of them faster than with uninstall instructions. A full system scan blocks virus reappearance and prevents traffic to malicious domains. 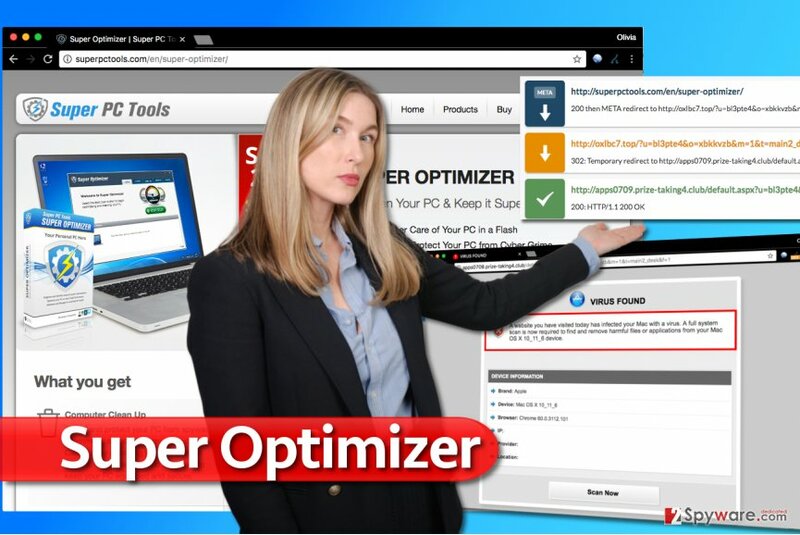 Super Optimizer by Super PC Tools Ltd. is a highly suspicious program that claims being able to remove unnecessary registry entries and bad files that are decreasing system's performance. Users can easily download this optimization tool voluntarily as it is promoted via various third party websites as a useful tool. The tool has a bad reputation because it tends to display misleading information in order to trick people into paying for the full version of the software. We have noticed that Super Optimizer has also been spread via other software without direct users' approval. For this and some other reasons, it has already been labeled as a potentially unwanted program (PUP), adware and even scareware. It seems that it targets computer users from all countries, but many victims are from Germany, according to DieViren.de. Even though the developers of SuperOptimizer claim that this is a reputable PC optimization tool, you should think twice before downloading it. After testing this program on our computers, we have noticed that Super Optimizer virus starts initiating its registry scan right after it is installed on computer. It should look for outdated registry entries that are causing slow downs of your system. 1336 items and settings are slowing down your computer. To optimize settings, fix problems and speed up your PC you need to register Super Optimizer. After showing such and similar warnings, it offers purchasing the full version of Super Optimizer but you should never do that if you don't want to spend your money on nothing. Therefore, we would like to recommend you not to trust it and NEVER pay money for this application as you may only loose your money and disclose your personal information to people that you don't know. If you want to get rid of this program without wasting your time, please, scan your computer with Reimage. UPDATE! Super Optimizer was updated in the middle of August, 2015. After being installed on the system, this program “performs” a system scan and then displays exaggerated scan results. In addition, it displays 'Would you like to register Super Optimizer now?' alert on computer's desktop and promises that this will optimize PC's performance. Please, do NOT fall for this trick! You need to remove Super Optimizer from your computer without any delay! When our researcher attempted to enter Super Optimizer's official web page, she got redirected to a suspicious website claiming that she had a virus on her computer. That was a misleading ad. Since the indicated optimizer is promoted as a legitimate application, it can be downloaded from various file sharing web pages. However, beware that it may also show up on your machine out of nowhere. That's because it may also spread around using bundling. Usually it is hidden in installers of download managers, PDF creators and similar programs. To avoid installing unnecessary system tools on your PC, you should avoid Quick, Recommended and similar installation options while installing freeware and shareware on your computer. Instead of these options, opt for Advanced or Custom installation and follow every step in order to reject installation of PUPs. You may find suggestions to install various extensions, add-ons and plug-ins, as well as to change homepage or default search engine, but you should never accept such propositions, especially when you are installing unknown software. 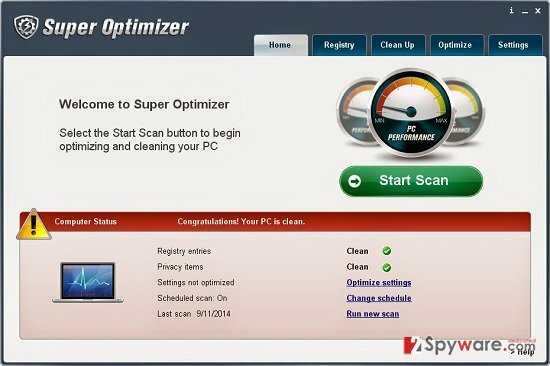 If you have already noticed that SuperOptimizer scanners on your PC, you should ignore them. As Super Optimizer is not a virus or malware, you will probably find it on Add/Remove Programs list. However, it is very likely that it has installed registry entries that will help it to stay active even if the main entry is removed. First of all, open Windows Task Manager (Ctrl +Alt +Del) and go to Processes tab to kill SuperOptimizer.exe process. Then uninstall Super Optimizer by Super PC Tools, Ltd. via Control Panel. Afterward, fix Windows Registry by removing unwanted entries. To fix Windows Registry, search your computer for regedit and open it. Here, click Ctrl + F and search for SuperOptimizer or Super Optimizer. Delete the keys associated with it. Here, look for Super Optimizer or any other recently installed suspicious programs. Wait until you see Applications folder and look for Super Optimizer or any other suspicious programs on it. Now right click on every of such entries and select Move to Trash. When in the new window, check Delete personal settings and select Reset again to complete Super Optimizer removal. Once these steps are finished, Super Optimizer should be removed from your Microsoft Edge browser. Here, select Super Optimizer and other questionable plugins. Click Remove to delete these entries. Now you will see Reset Firefox to its default state message with Reset Firefox button. Click this button for several times and complete Super Optimizer removal. Delete Chrome extensions that might be related to the said optimization tool. Here, select Super Optimizer and other malicious plugins and select trash icon to delete these entries. Click Reset to confirm this action and complete Super Optimizer removal. Here, select Extensions and look for Super Optimizer or other suspicious entries. Click on the Uninstall button to get rid each of them. Now you will see a detailed dialog window filled with reset options. All of those options are usually checked, but you can specify which of them you want to reset. Click the Reset button to complete Super Optimizer removal process. ^ System maintenance is important, but don’t fall for new fake helpers!. G Data Blog. Security Blog. This entry was posted on 2017-08-21 at 09:57 and is filed under System tools, Viruses. You can quickly scan the QR code with your mobile device and have Super Optimizer manual removal instructions right in your pocket. How did you remove Super Optimizer?